The Taj Mahal is situated in Agra, Uttar Pradesh, India. Taj Mahal was built by Shah Jahan who was a Mughal Emperor in memory of his wife Mumtaz Mahal. The construction of the architecture was completed in the year of 1653 A.D. It took almost 22 years to complete the construction. About 20000 workers contributed to the completion of the great monument. Without any doubt, this building is one of the most beautiful and fascinating monuments of the country. Taj Mahal is also counted among the seven wonders of the country. The complete building of Taj Mahal is built with the use of white marble. It is claimed by historians that the best of workers from entire India and central Asia were brought to make the costliest tomb as Shah Jahan did all to make it unique and left no stone unturned so that people for ages may remember this epitome of love till the world will exists and perhaps his dream is still alive. The gorgeous monument of Taj Mahal is located at the bank of the river of Yamuna. Masterpiece in terms of beauty and symmetry, it is an architecture which can skip your heart beat. Due to the mirage effect, it looks like the building is dancing on air and the secret is revealed when you enter through the main gate. Every year a large number of tourists visit Taj Mahal to witness the incomparable beauty of the architecture. There are about 22 domes situated at the main gate which have the holy messages of Quran written on them. The platform of Taj Mahal is made up of marble with a sandstone platform below it. Some great precious stones are also inscribed on the interior of Taj Mahal as part of the decoration. Taj Mahal is amongst one of the seven wonders of the world and attracts tourist from entire world. Taj Mahal is also a place widely acclaimed as “Must See Place before You Die” on this planet and especially in India. If you are a traveller and passionate to know and see the most beautiful monument of the world, then make it to travel to Agra, in India and see with your eyes a monument resulted out of sheer love and affection of a king for his estranged wife. The monument of love is made of white marble. Further, Taj Mahal is surrounded by green garden. Though this tomb was made for his love but also called for cutting off hands of chief architect Isa Khan and workers so no one could result any more Taj Mahal. October, November, December, January, February & Mid-March is considered to be the best season if you want to enjoy Taj Mahal in its best weather with breezes of Yamuna River which complements the symbol of love. Taj Mahal has every reason to make you fall in love with its beauty at different times of a day. One has to be at sunset to believe what is being written here that how it has make up of colours again ranging from fiery yellow to bit exotic orange but changes to shining pearl white again. Beauty is a t its best what can be called if one has to feel the most sensational sight along with the calmness this place has beneath full moon. A lifetime experience to cherish for years when you see full moon lighting this monument with silver as if Taj Mahal is wearing clothe at different times after all love of Shah Jahan is still protected by beauty of nature and full moons does it all. Apart from this magnificent architecture, there are a number of other places located near the Taj Mahal which can also be visited. Most of the architectures belong to the Mughal era while some are even older. Agra Fort: The crescent shaped fort is extended to the eastern direction. The whole architecture covers a total perimeter of 2.4 kilometers. The great artistic work done in red sandstone enhances its beauty. The Diwan-E-Khas, Khaas Mahal, Samman Burj, Shish Mahal, Diwan-E-Am and the Moti Masjid are some of the other places which are worth to visit. 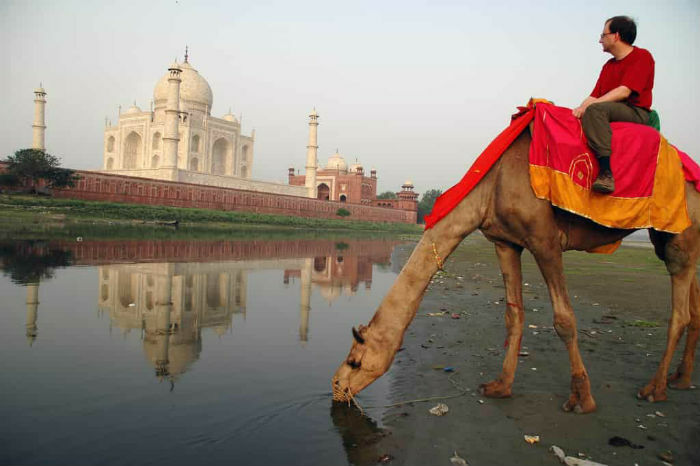 People of this world knows Agra as place famous for Taj Mahal only. But Agra is also famous for its finest carpets and jewellery. One may also find some of the best leather shoes. People speak in Hindi, Urdu and English. Even guides knowing languages are also available to make your journey comfortable if you don’t understand any of the language including English. Taj Mahal is located in Agra which is near to capital Lucknow of Uttar Pradesh (363 kms) and also very near to India’s capital New Delhi (200 kms). Agra is well connected with all modes of travel be it Air, Train or Road. By Air: The IGI Airport of Delhi is the nearest airport. By Train: The railway station of Agra is the nearest railway station. By Road: From Idgah Bus Stand, the direct buses are available to major cities of India.